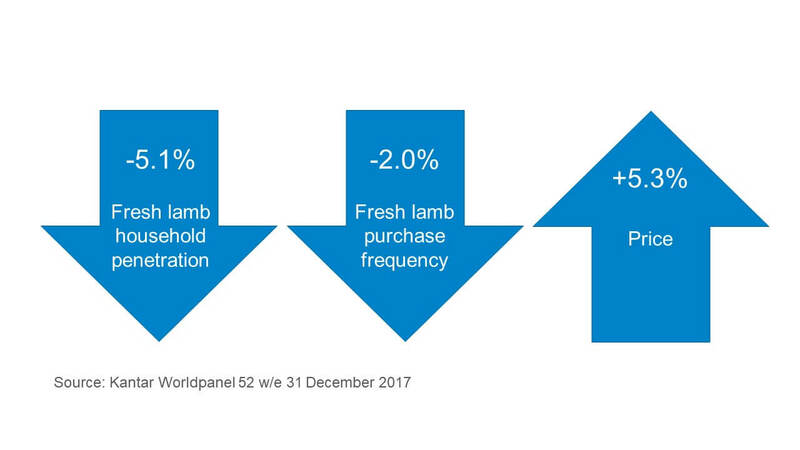 Signs of recovery for the fresh lamb market were seen over the Christmas period, according to Kantar Worldpanel data. Following a spell in the doldrums, sales increased in both volume and value during December. In this article, market research carried out by AHDB is used to explain ways in which the festive sales boost can be built on by aligning lamb with key consumer trends. Retail prices for fresh lamb rose by more than 5.3% in 2017, making it just over £1 per kilo more expensive on average than fresh beef and £4 higher than pork and chicken, according to Kantar Worldpanel. Despite the sales bounce seen over Christmas, during 2017 the number of households buying fresh lamb fell by five per cent and those who continue to buy into the category bought lamb less often. AHDB/YouGov research shows consumers perceive lamb joints and chops, in particular, to be expensive and not good value. On the other hand, beef mince, whole chicken and sausages/bacon are considered to be good value and cheap. The British public are savvy shoppers, seeking the best value for money, making the relatively high price point of lamb a possible barrier to purchase. While not ignoring the market share of established multiple retailers, those in the lamb industry should consider opportunities to work with Hard Discounters, a route-to-market enjoying double-digit growth. Their low-price model of trading could bring lamb to a cohort that is currently finding lamb too expensive. Kantar Usage research shows consumers spending less time preparing the main meal of the day. This research also sees meals with lamb at the centre taking longer to prepare than those including other proteins. When compared to chicken, AHDB/YouGov data shows lamb is perceived as less versatile and less suitable for midweek meals, when time pressures are most acute. In response, AHDB has sought to target smaller households and midweek meal occasions with its marketing of ‘mini roasts’. 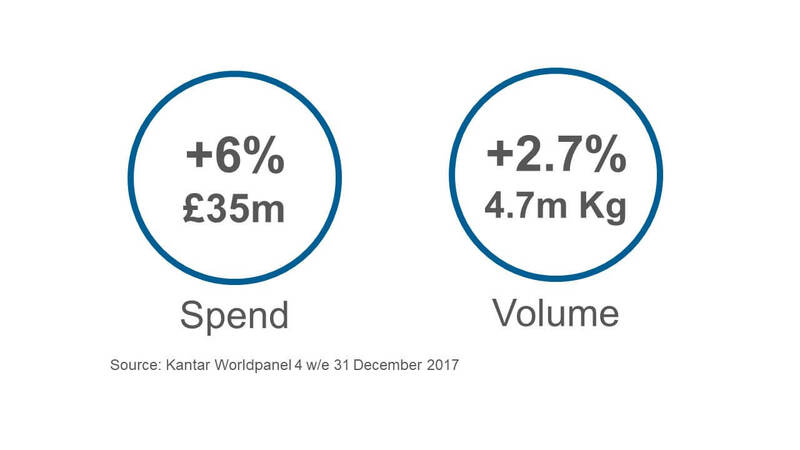 Chilled and frozen ready meals and ‘ready-to-cook’ products have seen fast sales growth in recent years, with Kantar Worldpanel data valuing the market at over £3.5 billion. Lamb must be positioned as a relevant option to shoppers seeking quick and easy main meals. This could even prove to be a gateway to increased sales of fresh lamb, getting consumers back into the lamb-eating habit and at the same time challenging chicken in the market for convenient meal solutions. Cuisine from countries as diverse as China, Italy and Mexico is quickly growing in popularity and includes some of the nation’s favourite meat dishes. Lamb, though, is not usually an ingredient in popular meals like fajitas, chilli con carne, spaghetti or stir-fry. These are more likely to include alternative proteins or no protein at all. During the last year, AHDB has championed lamb mince, which is an ingredient in some ethnic foods and fits in with the consumer need for familiarity and convenience. Lamb promotions should target those seeking a fresh, natural and local product. Mintel research shows 67 per cent of shoppers say that being able to trace a meat product back to the farm would make it more trustworthy. The average price for lamb is higher than beef, chicken and pork, so the industry should make a case for this premium. Prevailing shopping and eating habits pose challenges to the lamb industry. Fewer households are buying lamb and it is important that this decline is arrested before this habit of eating lamb is lost. One way to do this is by presenting lamb in a way that is consistent with current consumer trends.